In London’s crowded restaurant scene, there’s nothing more exhilarating than finding a restaurant so good that you’d happily keep returning to it. This was how I felt about the new branch of Dirty Bones in Kensington. Situated down a neon-lit staircase, the restaurant and bar area is located in a chic subterranean space featuring a DJ booth, seating alcoves and heart-wrenchingly good food. Dirty Bones serves NYC-inspired comfort food from an epic menu featuring succulent meat dishes, moreish sides and exquisitely created cocktails. We started our meal with a few cocktails including Mutts Nuts made with Woodford Reserve bourbon, cinnamon and vanilla-infused, Rhum Old Fashioned with Chairman’s Reserve spiced rum, gomme syrup and orange bitters and Bow Down Peaches with Ketel One vodka, peach and coconut water. It was evident that each of the cocktails were made by experienced professionals using the best ingredients making them irresistible. For our starters we tried homemade cheeseburger dumplings filled with burger mince and melted cheese, as well as buffalo hot wings with hot sauce and blue cheese dipping sauce. These delicious starters set us up perfectly for our main course! 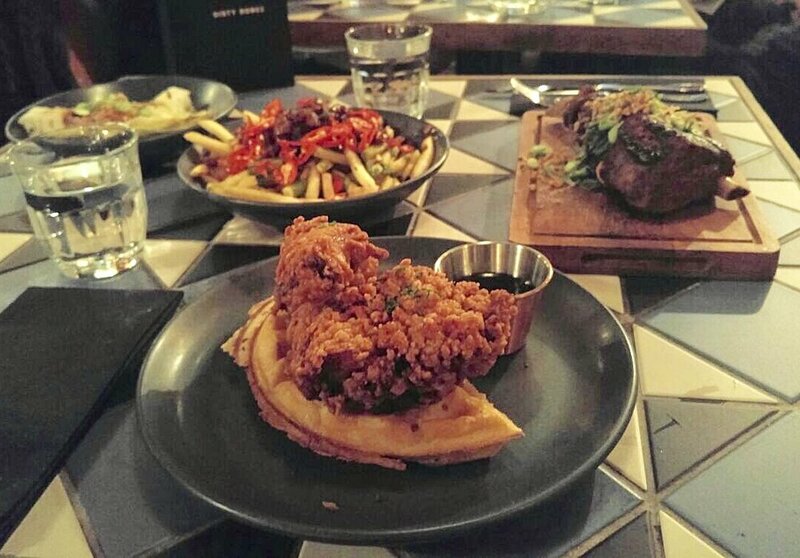 I ordered the crispy fried chicken served on a freshly baked waffles with a shot of maple syrup; we also tried the tender beef short rib with cayenne and coffee-spiked BBQ sauce. Both dishes were divine and despite the large portion we finished it all. As well as my chicken and waffle main course, my favourite dish was the crispy lamb fries, served with generous amounts of sweet miso, red chilli and jalepeño sprinkled on top - this was so good we had to take a portion home! We couldn’t leave without trying dessert and we ordered the caramalised banana waffles served with chocolate sauce, blueberry jam, salted peanut butter gelato and crushed nuts, as well as the peanut butter cookie cup which was literally a cup of salted peanut and caramel joy! Although the food at Dirty is of outstanding quality, it is averagely priced and definitely worth the large portion sizes. Main courses range from £8 to £15 and starters and side dishes are around the £5 mark. The cocktails are also priced around £9, matching standard London prices. 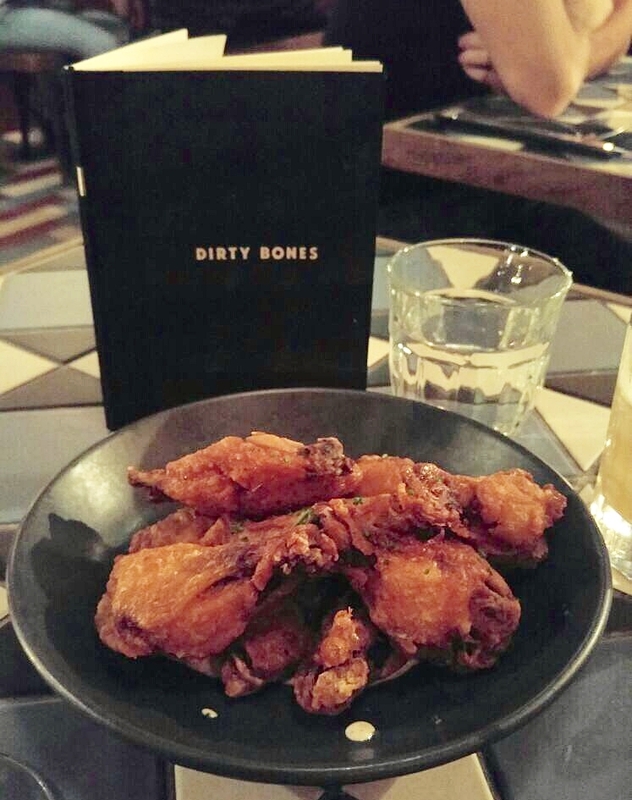 Dirty Bones has made it to my favourite restaurant list. The delicious food, uber-friendly service and vibrant atmosphere are all things I look for in good restaurants. Thankfully, with live music or DJs on weekend nights, as well as a boozy brunch menu, there are plenty of reasons for me to go back! A special thanks to Dirty Bones for the invitation and for being fabulous hosts! Nov 18 Travel: How to make the most of Venice in 48 hours.